One flow to rule them all. Photo taken somewhere in SFDC HQ. The functionality I wanted to build involves doing a similar action against a lead, account and opportunity. As a side note, I have started using this methodology in my criteria’s when I look for query results instead of looking for nulls. The next step is the workflow’s. In my case, there are three workflows and each workflow kicks off a flow trigger. If you do not have flow triggers, go get them enabled! Flow triggers are great for these small jobs, though you could do this with the process builder as well…The flow triggers are themselves unremarkable. The only thing they are doing is passing the record ID over to the flows…wow, reading this one over, this is really boring functionality. Seriously, this is like trying to make a pair of needle nose pliers or a shop light sound exciting! However, like needle nose pliers or a good shop light, this is a very good piece of functionality to know about. You can add new object types in very easily and with out creating more and more flows. Recap? Sure, why not, this blog post is seriously shorter than half my papers I wrote in High School…Size 12 font! Double Space! Times New Roman! Business, Business Numbers! Is it working? The only real “gotcha” to be aware of is that if you are using custom object, the record ID’s might have different prefixes based on your environments. You will especially find this true if you are migrating up the custom objects. As always, let me know if there are any questions, comments or suggestions! How long has it been? A long freaking time! Between summer vacations, coaching soccer and cub scouts, there has not been much idle time for this boy to blog, which stinks because there has been so much fun stuff figured out! But, here I am, eating a turkey sammich, listing to some EDM on Slacker Radio and trying to get a blog post cranked out for you all. What I am going to blog about is an annoyance that has been going on for quite some time… the issue of workflow email alerts. In fact, this idea is over 5 years old! See, when you build out an email alert and it fires…well…it just fires. You can do a work around that involves carbon copys to an email to salesforce box or creating activities, but those workarounds are either not scaleable or they don’t give you much more information than “this email was sent!”. But, I did find a work around that is scalable using my favoritest thing ever, flows*. Now, did you see that little thing there? That Asterix? Yep, that is there for a reason. It is there because I wrote this out using flow triggers. I am sure you can do this with process builder, but I am just documenting the flow trigger function here. I like process builder, but in this case, I just need to crank something out quick, so I am using triggers. The “Too Long; didn’t read” version is this. 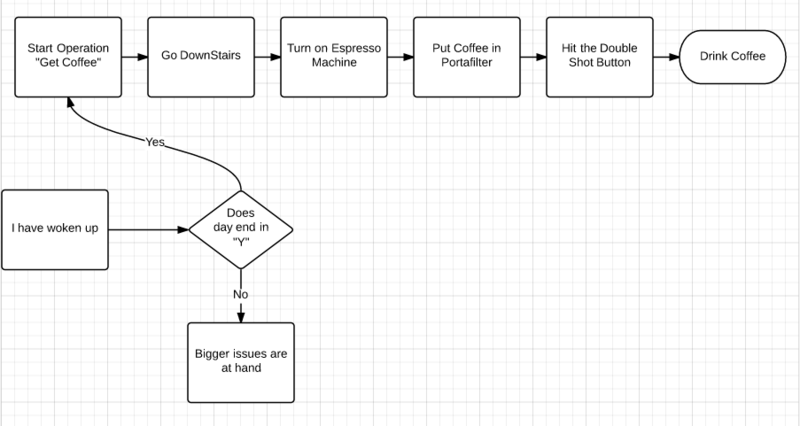 I created a flow that runs via the workflow (remember, I am using flow triggers!). When that flow trigger runs, it will do two things. It will send off the email alert AND create an emailmessage record. Yeppers, I said create an emailmessage. What I have found is that within salesforce you can create an email record through a flow and it will happily sit there. The trick is that you will need to pass the record ID from where you are starting and use that ID for the “parent ID” field on the emailmessage record. This is a good jumping off point if you want to venture forth and tinker around yourself. For those of you that want more details, here ya go! My assumptions at this point are that you are comfortable creating your own method of running this flow. As long as you can pass variables over from the record, you should be good to go. This flow only has two elements. The email alert (which is already built) and the record create for the email message. There are a bunch of things you can build out when you create the email message, but I am just going to cover the basics. Parent ID – this should be the record you want this emailmessage living under. In my case, it was, well, case. Status – Status is a funny one. It is displayed in plain English but the value is actually numeric. In my case, I am recording a copy of a sent email, so I used a status of 3, which is “sent”. Create a text template called “Email body”. Enter your data and insert the text template “linebreak” wherever there should be a line break. If you need to get values from the parent record, insert them here. I choose to pass them all over via the flow trigger, but you could just as easily do it with a requrery. The end result is that the emailmessage you created via the flow will have a similar look / feel to the email that was sent out via the alert. Actually, it will look way more like the Text version, but really the point is to have this copy not so much to look pretty. As I said before, I will leave the method of running this flow up to you, so let’s talk about the results. By doing this, I was able to get a copy of the alert email attached to the parent. I was then able to remove the activity creation on the workflow since that was how we were noting that an email was sent out. The email copy is an actual copy, so we know what was sent out, which you couldn’t do through the activity. As an added benefit, running this via the flow allowed me to do some extra shenanigans that you really cannot do through a workflow, like running queries on other objects and adding them to the email. The last benefit is crazy obvious, this is a LOW maintenance function. If a new value is added to the email alert, I (or another admin) just needs to add it to the record creation function…no dev time needed! Automagically create tasks from templates in Salesforce! The act of me waking up will prompt a series of tasks, and this is something that is repeatable EVERY TIME. The key to this exercise is identifying ACTIONS that will require a set of tasks to be created. This is the challenge that I decided to take on with my Salesforce BFF visual flow and my Salesforce Frenemy Process Builder. The idea was that when a case meets a certain criteria, a series of tasks will be created…and is this wasn’t challenging enough, I decided to kick it up a notch and design the functionality in such a way that the tasks are not hard coded but actually templatized. At a high level, what will happen is that the flow is kicked off via the process (or trigger). The flow does a query of all tasks and ONLY pulls those that meet our templatized criteria. These are then used as templates for the creation of new tasks. The example below is how I built this out so that a series of tasks are created when I mark a case as “Ready for Coffee”. Enough talking! Release the Screen Shots! In this case, I note that the task is a template by placing a flag on the subject and setting the task status to completed. By setting the status to completed, you can keep the task from staying open and visible on the users home page. In the example I am building out, I am looking for a subject that ends with “!MakeMeCoffee”. I am using the connector for this because…well…it works and I didn’t want to do it by hand! else, well, you might end up with a lot of stuff! As usual, when I built out my flow, I built out one version that is driven off of the UI (pictured below). This way, I can do rapid testing without activating anything. After things are 90% happy, I will remove UI elements and save it as a new flow. 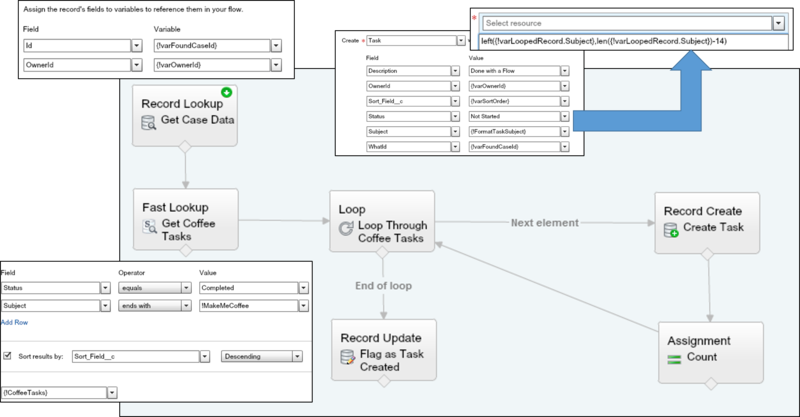 Process builder is my frenemy…I see the potential, but am still really sore over loosing flow triggers. 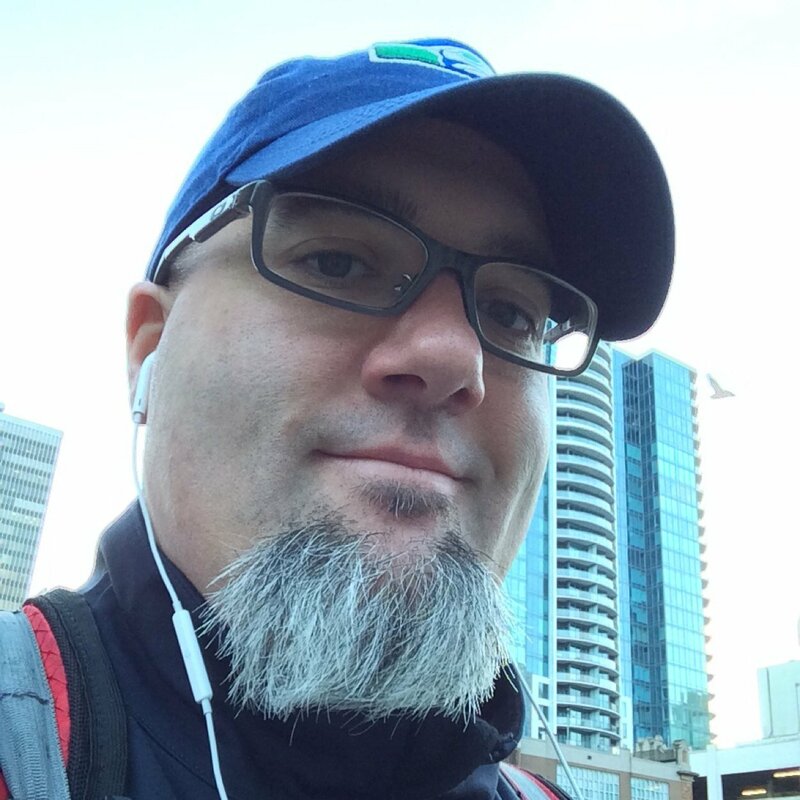 But, the cool thing is that we have folks out there in the Upper Echelons of Salesforce looking at our comments and reading our blogs and they are making changes and I am excited for where process builder is going! Soapbox aside, I created a process for case and set the criteria. The ONLY thing this process is doing is calling the flow and passing over just enough information to run. 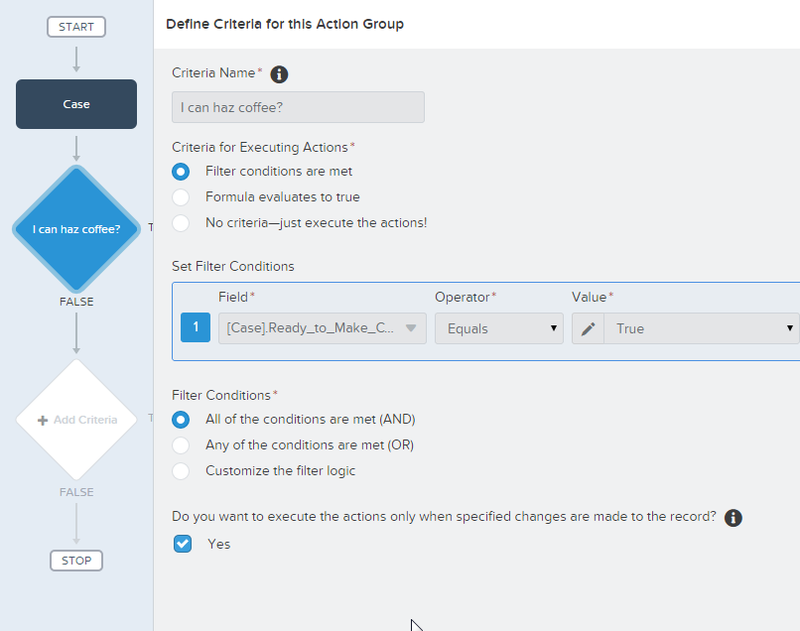 In the past when I have used flow triggers, I tended to push over more information, but since process builder requires activate / clone / activate cycle if something goes ker-plewy (for the record, I did this cycle 7(!) times for this demo! ), I have switched over to just pushing over the minimum as a variable. OK, so the work is done, you are all set…Let’s see how this works! I have my case created, and I am going to check the box that signals that I would like some coffee. As you can see, tasks are now created associated with the case. To emphasize again, the power of the template is that if I (as a user, not a system admin) wanted to change something about the tasks are created, I can do so on my own and not have to wait for a system admin. Another great benefit for the admin / developer is that nothing is hard coded except for template criteria…and even that could be made more dynamic to handle further scenarios. Further mind blowing awesomeness is that this is NOT just for tasks on cases…it could be anywhere…or even applied to other objects! Questions / Comments / Buy me a coffee? 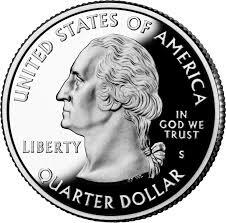 OK, maybe .25 cents worth! I started playing around with Salesforce Process builder and I figured I would give the world my 2 cents on this new functionality! The process builder is a HUGE step forward. It is really cool, especially considering this functionality is less than a year old. If you were amazed by what you can do with #ClicksNotCode before, this will be mind blowing. Up to 5 decision points. Raise your hands if you have ever had to dissect a HUGE workflow with multiple gnarly logic steps…OK, this one is for you all. Stop weeping, process builder is going to help tremendously. What I like is that you can have up to 5 conditions grouped under a process that run really as separate statements. Run LOADS of Actions. There is NOTHING quite a fun has building out a super awesome workflow and then rebuilding the logic so you can run an approval process #sarcasm. One place for all this stuff now! Great UI. I love Visio. Seriously, love it. The UI of process builder makes documentation a snap since you can just grab a screen shot and see in pictures what the heck is going on. You know what would make this better though? A Nice “Click here to Print” button that would print out the process along with all the “stuff” with it. Yes, I used “stuff” as a technical term. Versions are a PAIN. To be fair, this is a beef I have with Flows as well. I should be able to deactivate, make changes and then reactivate. One of the MAGIC things with workflows is that you could make a change, save it, test it and be done. With Process Builder, you have to clone, enter a new name (WHY! ), save then activate. If you find something goofy, guess what, same dang process. Much like flows, you very quickly generate a TON of versions. Can’t edit an inactive version. Yep, this is another versioning thing. One of the things I particularly like about flows is that I can step into a previous version, make edits and save it. Of course, there is a warning that I cannot over write the previous version, I have to save it as a new flow or new version of the flow. Sometimes, if your versions are different enough, you have to dig in and see what you could have done differently. Replacing Precision Tools. You could create a flow trigger stupid fast. You could do it from multiple screens and you could edit it after you have associated it with a workflow. Here is a corny analogy. Let’s say that you noticed you have a screw loose on a piece of furniture. To tighten the screw, you would go and grab the cool screw driver with multiple bits out of your tool box and tighten the screw. This is like using a flow trigger. Just the minimum to get the job done! If you were to do this same action the process builder way, you would grab the WHOLE toolbox which includes tape measures, hammers, pliers, pencils etc…and bring it back to the furniture. Sure, the toolbox contains the screw driver and you are accomplishing the goal, but you just don’t have to lug that toolbox around. So, that is that. Let me reiterate again…I love process builder and I think it is a fantastic piece of tech, but don’t take away the precision tools because the tool box is getting fancier!